My favorite vegetable, no, my favorite food is the artichoke. I'm not sure what it is about it. Perhaps it's the layers of leaves that lead to the increasingly tender center. Maybe it's the way that the most succulent part is guarded by the unassuming choke. Mostly likely it's that the leave serve as perfect ladles for a delicious dipping sauce, which in my house, is typically butter, lemon, garlic, and salt. 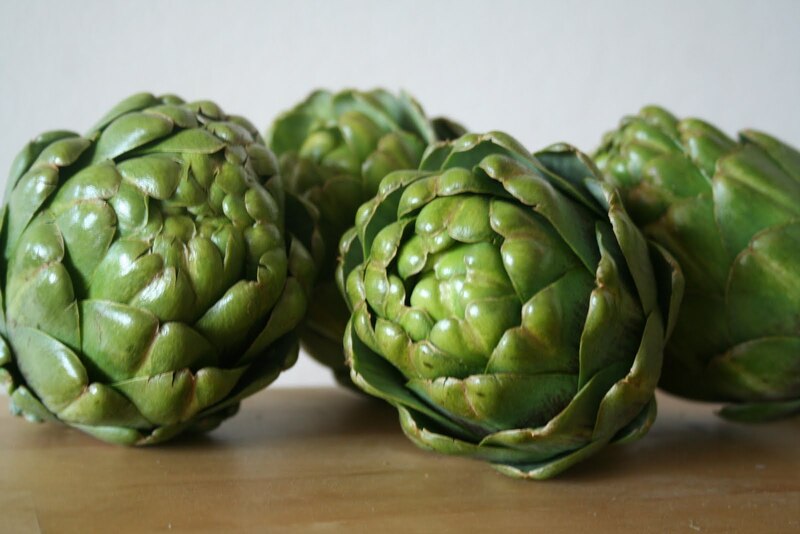 In fact, aside from artichokes in a can, I've never really had them any other way (okay, maybe steamed vs. grilled, but the sauce is always the same) and because I love them so much, I've never really thought about branching out. However, while talking to one of my local farmers and asking him about freezing some of his beauties for winter, he pretty much ignored my desire for stocking for the winter, and instead, suggested cutting them in half and cooking them in the oven. The key is that these fresh, baby chokes are extremely tender when you get past the first few layers of leaves, you can even eat the choke! This is yet another example of how really fresh is really better. Preheat oven to 425 F (approximately the same temperature that it will take to cook the bread). Cut approximately the top 1/3 portion of each artichoke and peel the outer leaves off. I tend to leave a lot more leaves on than most recipes call for. You will be able to eat them, but you'll have to pull them off and scrape them with your teeth rather than just eating through them. I hate to waste any of the chokes, so you'll never see me cutting them all the way down to just the tender parts. 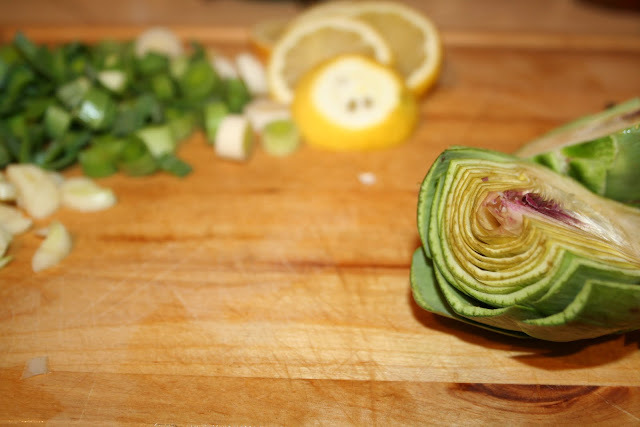 Cut the artichokes in half and scrape out the choke. You should be able to leave the purplish leaves since they're not too rough (if you're using older or store bought artichokes, definitely scrape out those leaves as well). 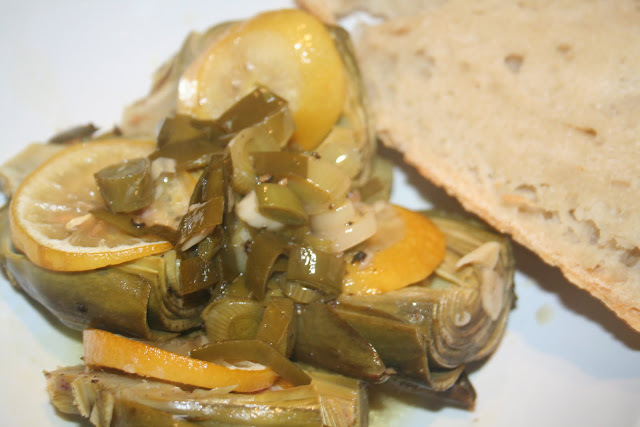 In an oven-safe large saucepan over high heat, mix all the ingredients, except for the artichokes and lemon slices, and stir. 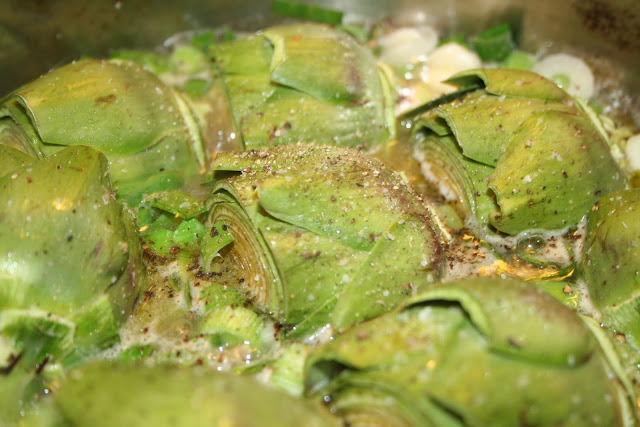 Place the halved artichokes inside down in the pan and season with salt and pepper. Scatter the lemon slices on top and cover with an oven-safe lid. Place in the oven. 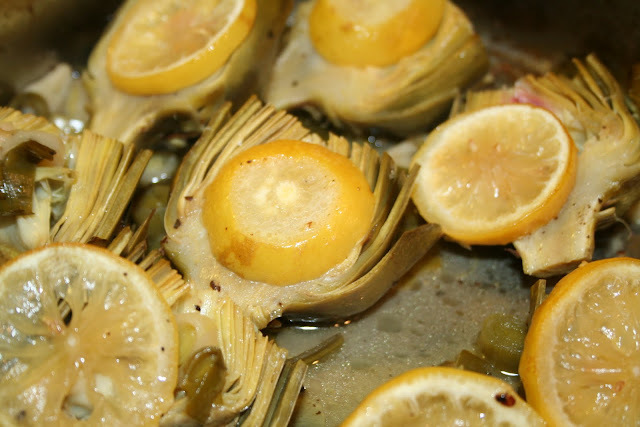 After about 25 minutes, flip the artichokes and place a lemon slice atop each half (helps to keep it from drying out). Re-cover and place back in the oven for another 25 minutes. Serve with warm, crusty bread to sop up the braising liquid.